NPR Special Correspondent Susan Stamberg will discuss“Why Museums Matter and the Arts are Important in Education” on Monday, Sept. 27, at 7:30 p.m. in the Memorial Ballroom, Hall Campus Center at University of Lynchburg. There are no more tickets for this event. The former host for All Things Considered, NPR’s award winning newsmagazine, Stamberg was the first woman to anchor a national nightly news program, and has won every major award in broadcasting including the Edward R. Murrow Award from the Corporation for Public Broadcasting. She has been inducted into the Broadcasting Hall of Fame and the Radio Hall of Fame. 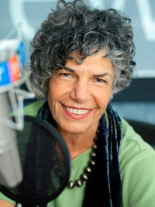 Beginning in 1972, Stamberg served as co-host of All Things Considered for 14 years. She went on to host Weekend Edition Sunday, and now serves as guest host of NPR’s Morning Edition and Weekend Edition Saturday, in addition to reporting on cultural issues for all the NPR programs. One of the most popular broadcasters in public radio, Stamberg is well-known for her conversational style, intelligence, and knack for finding an interesting story. Her thousands of interviews include conversations with Laura Bush, Billy Crystal, Rosa Parks, Dave Brubeck, and Luciano Pavarotti. Stamberg is one of the pioneers of NPR, on staff since the network began in 1971. A native of New York City, Stamberg earned a bachelor’s degree from Barnard College. She is the author of two books, and co-editor of a third. TALK: NPR’s Susan Stamberg Considers All Things chronicles her two decades with NPR. Every Night at Five: Susan Stamberg’s ALL THINGS CONSIDERED Book, was published in 1982 by Pantheon. Stamberg also co-edited The Wedding Cake in the Middle of the Road, published in 1992 by W. W. Norton. The lecture is sponsored by Friends of the Daura Gallery, School of Communication and the Arts, and the University of Lynchburg Fine Arts and Lecture Series.